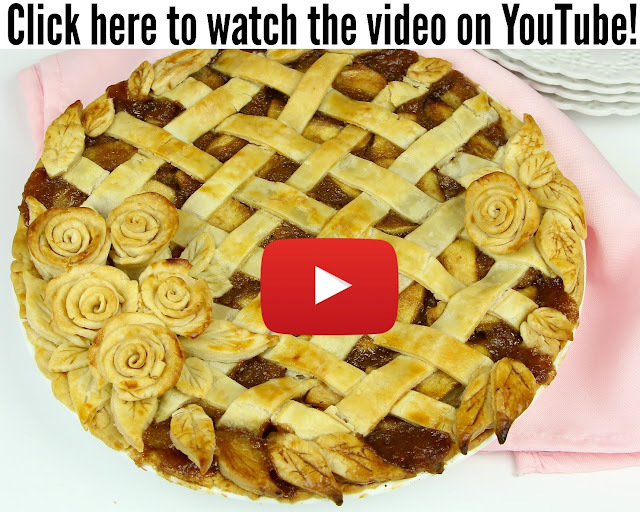 Welcome back to PIE WEEK, where every day this week I'm sharing a new pie video! 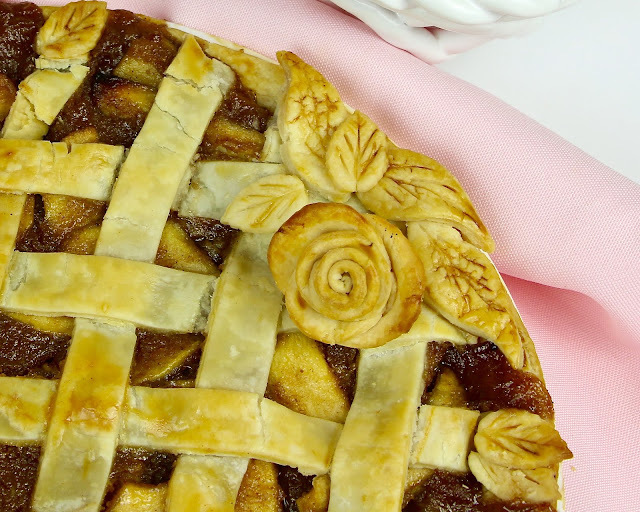 Today we are making the best apple pie. 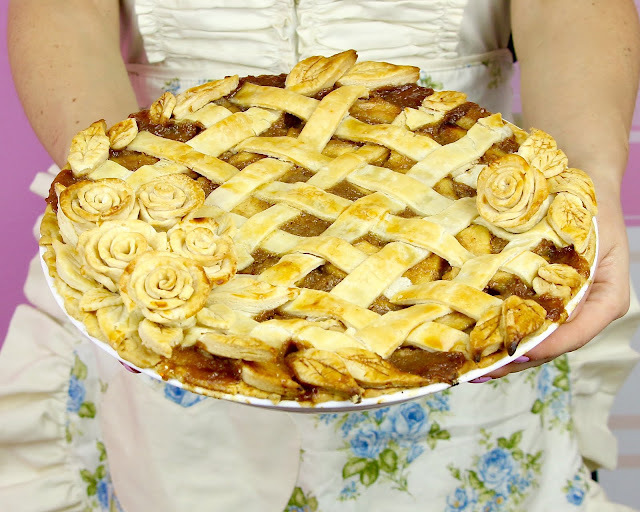 I couldn't do pie week without the queen of all pies. Apple pie is probably one of the most all American desserts out there, you can have it year round, for Thanksgiving or Christmas or picnics in the summertime. Basically, if there's one pie you're gonna want to know how to make, this apple pie should be at the top of your list! 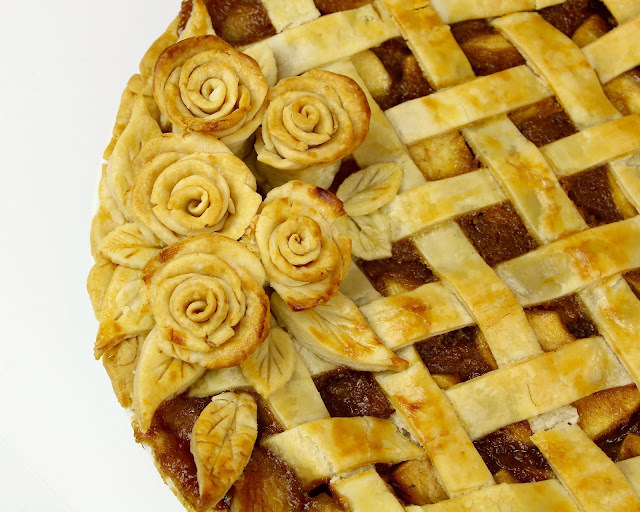 I decorated this pie with my Diamond Lattice Top and Pie Crust Roses, for an extra fancy touch. I am so happy with how it turned out and so in love with this design! 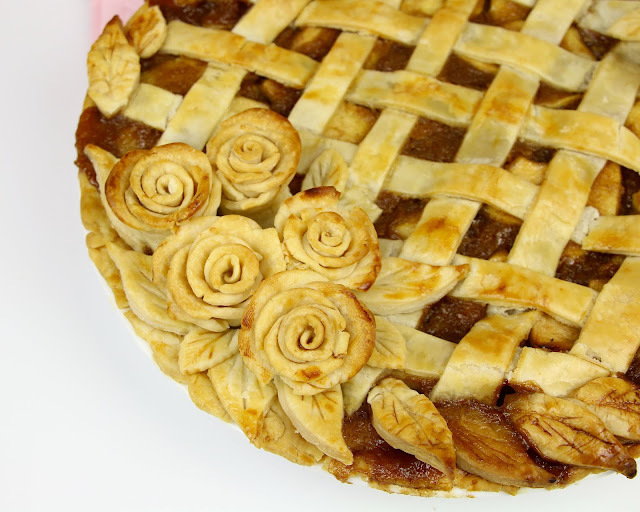 You can definitely just use a basic top crust, too, if you don't want to get super fancy with the decoration. Just place a whole pie crust over the top, slit some holes in it and seal to the bottom crust and you're all ready to bake. 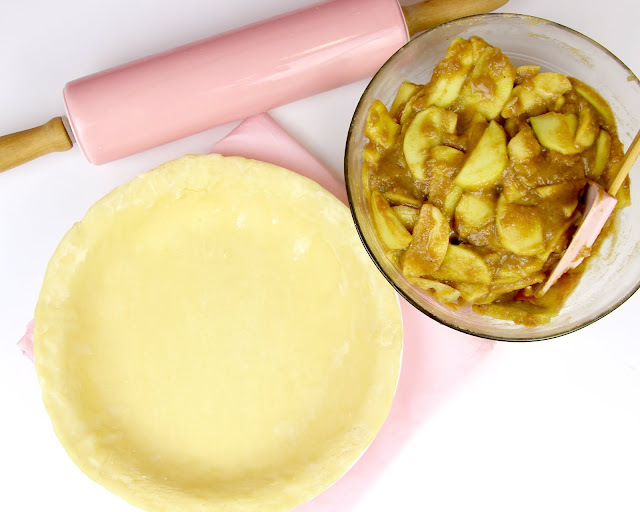 This tender, buttery, flaky pie crust, is filled with fresh juicy apples, smothered in a warm, gooey, caramel-y filling because I like my apples really coated in that thick saucy filling and that is exactly what this recipe will give you. Topped with these gorgeous pie crust roses, this pie is the ultimate show-stopper! And I promise they are not as hard as they look to pull off! 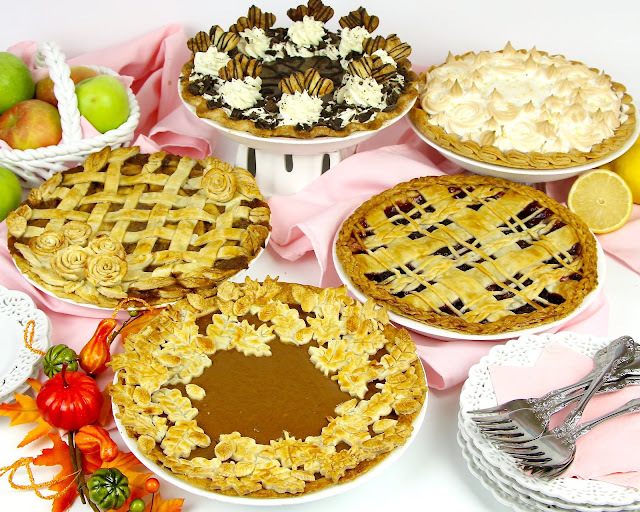 The outcome is so impressive that they are totally worth the effort. 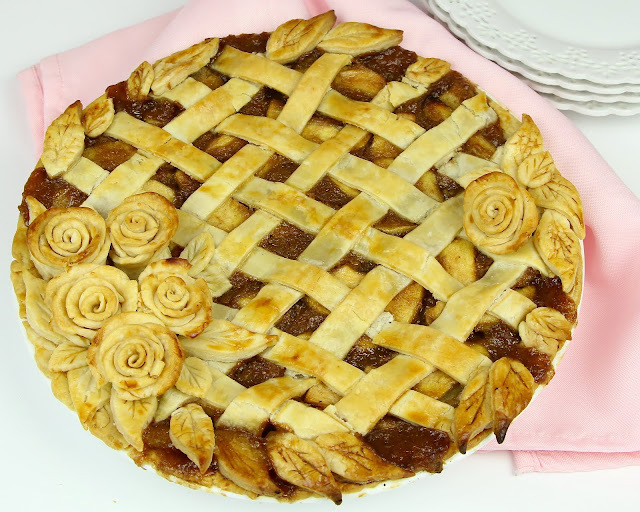 The best part is, you can make the crust and the filling ahead of time, then just put it together and pop it in the oven, if you want a make-ahead recipe. 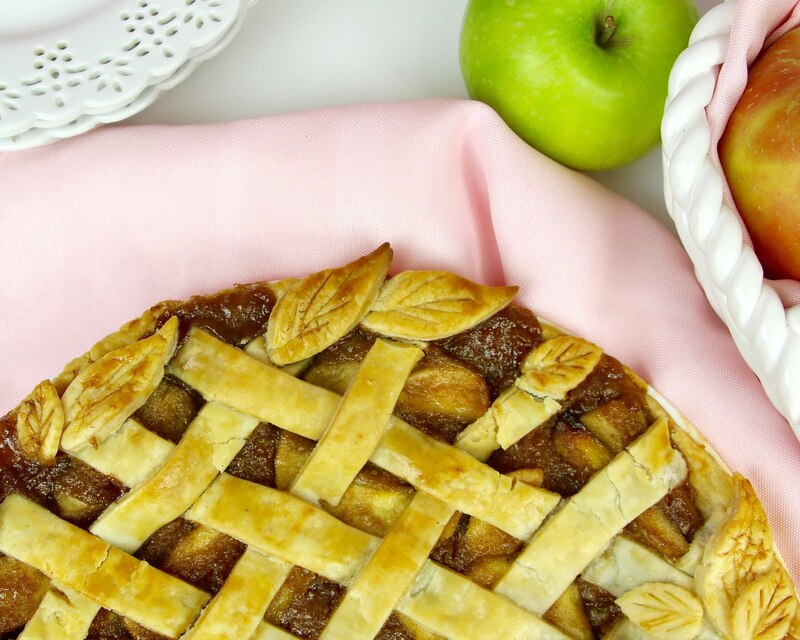 I love to just let it set in the fridge overnight, so the filling really has a chance to thicken up, for that ooey gooey spiced filling all over the crisp apples. Add some vanilla ice cream and you have got a plate of pure heaven. 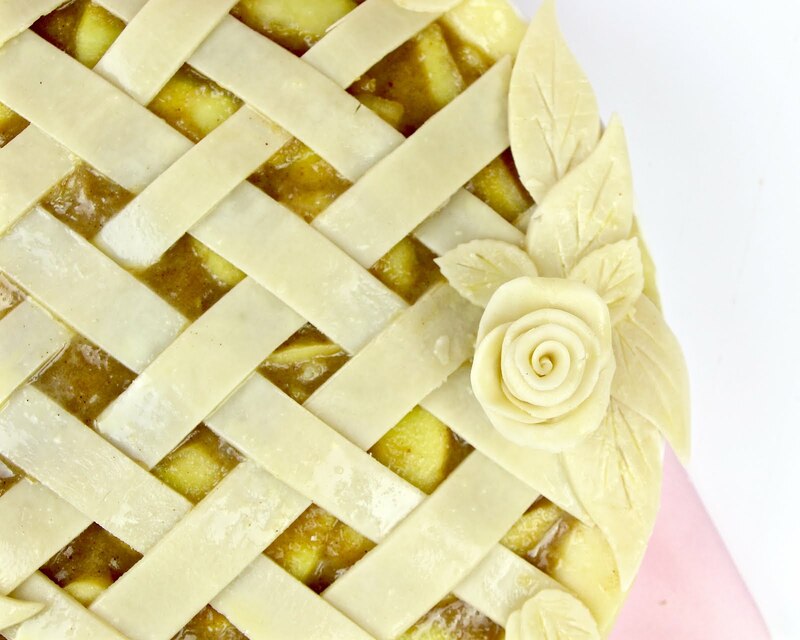 I always use green, Granny Smith apples, not because they're my favorite apple (which they are), but because they keep that crisp tart, juicy flavor even after baking, which pairs perfectly with the sweet brown sugar caramel filling and they don't get all mushy, like some other varieties! 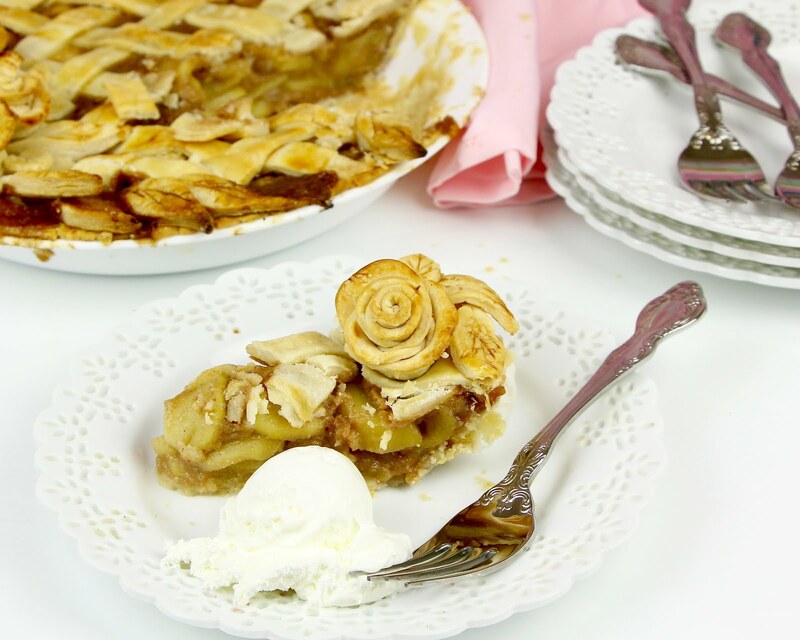 My secret ingredient that sets this apple pie apart, instead of using plain melted butter, we're using browned butter instead. 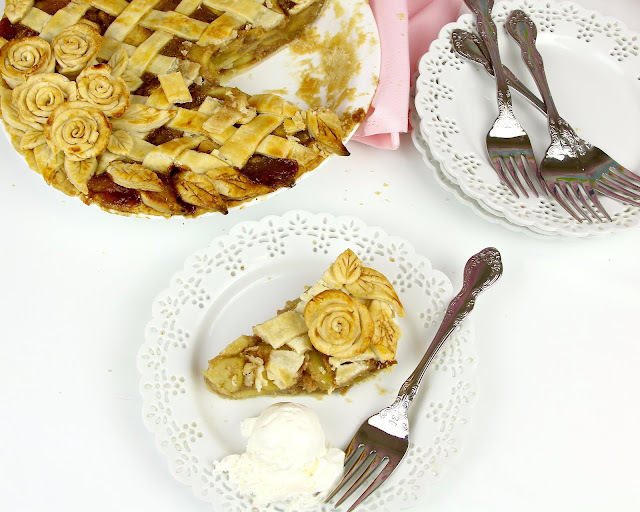 It adds a whole new dimension of caramely, toffee-like flavor to the pie that is so incredible. It's like liquid gold. 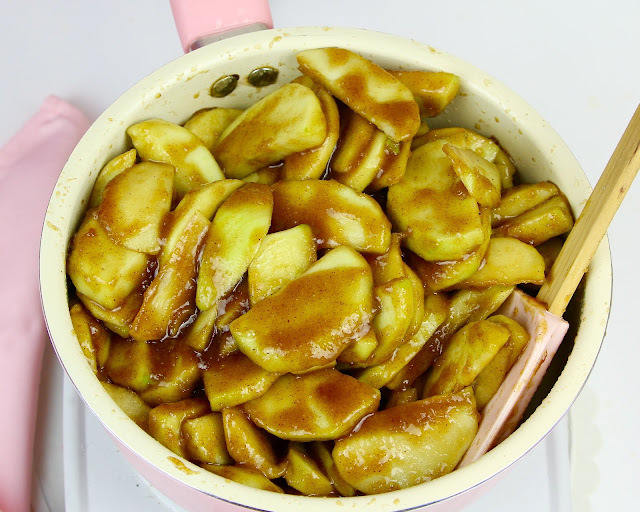 I like to partially cook the apples down for just a few minutes, so they release some of their juices in the pot and start to soften a little bit. By doing this, instead of just dumping the fresh apples right into the pie crust, the apples aren't going to shrink down in the pan, leaving you with that big gap between the top crust an the filling. 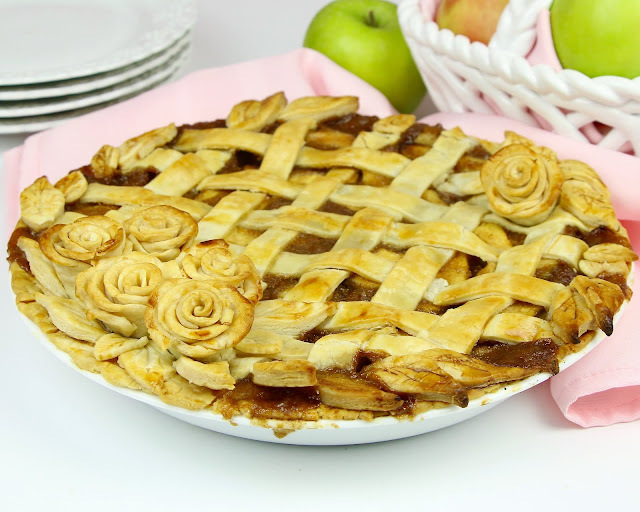 Also, you're not going to get that soupy filling that just runs out when you slice it, because we let the apples release their juices and thicken up in the pot first. For the roses and leaves, roll out one pie dough about 1/8" thick. 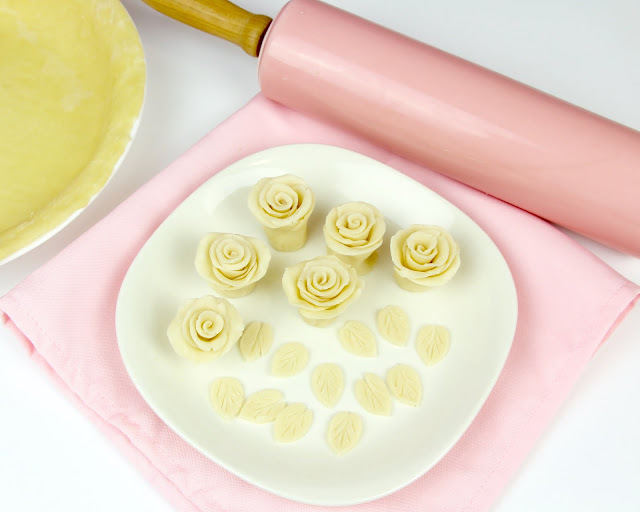 Use a 2" circle cutter to cut out 15 circles for your 6 roses (5 circles will make 2 roses). Overlap the 5 circles on top of each other and flatten the rounded edges. Roll them up all together and cut the roll in half, width wise, and place cut side down. 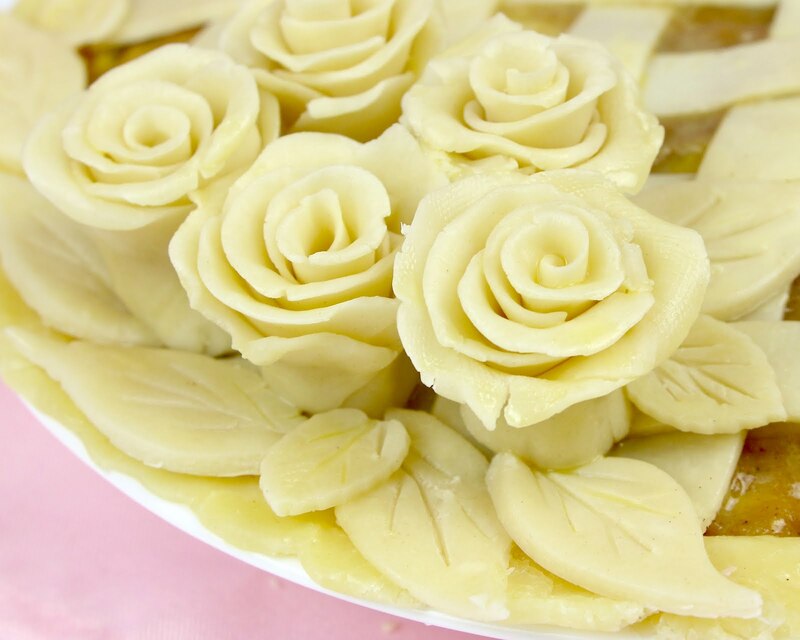 Spread out the petals of the rose and repeat until you have 6 roses. 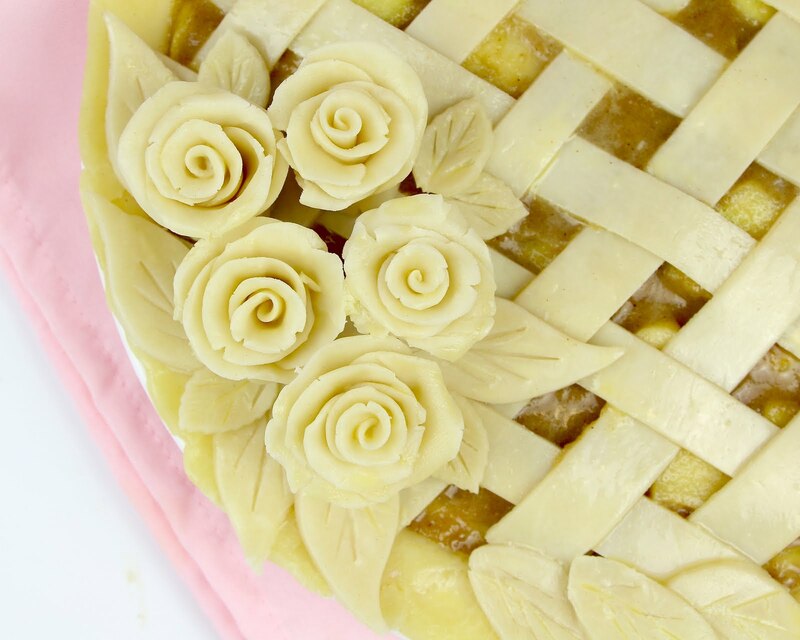 Cut out leaves with small and large leaf cutters, using a knife to create the veins. 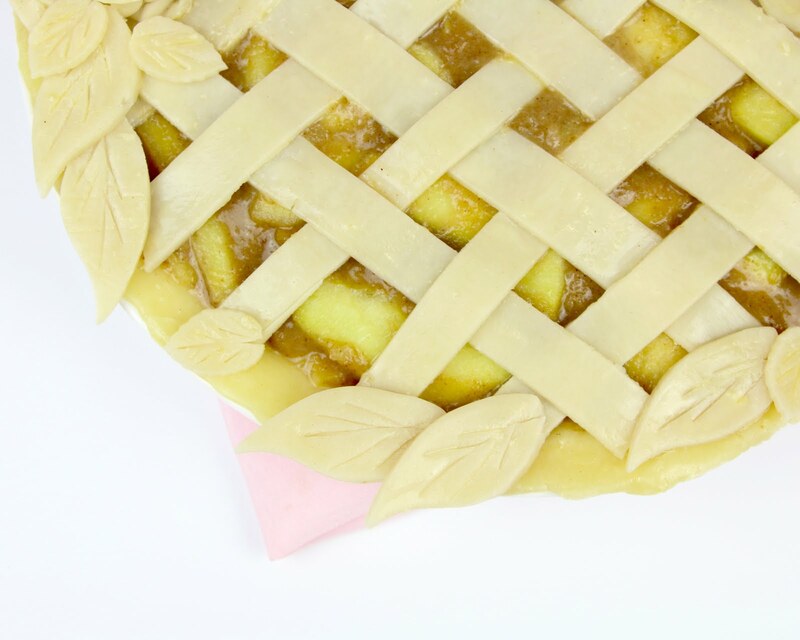 For the lattice top, roll out your second pie dough about 1/4" thick. 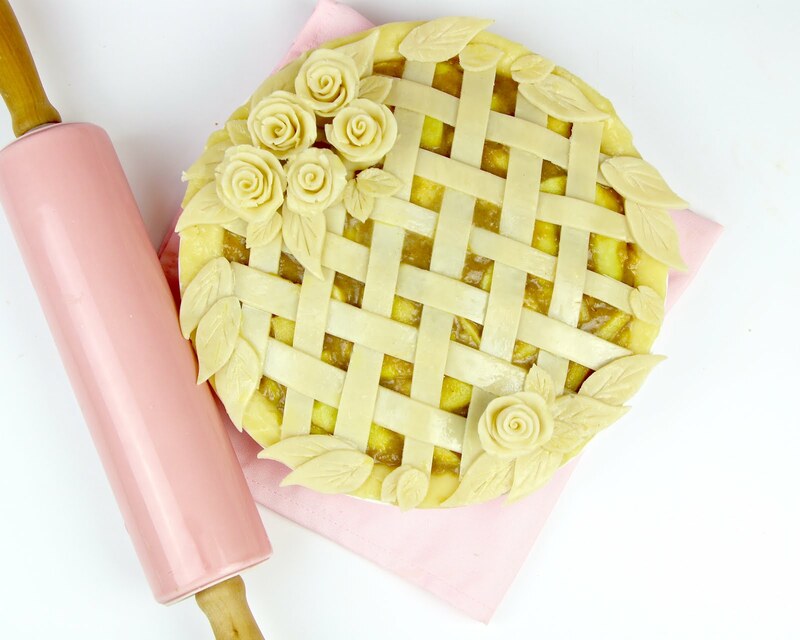 Using a ruler and a knife, cut out 12 1/2"-wide strips of pie dough. Cover and set aside. 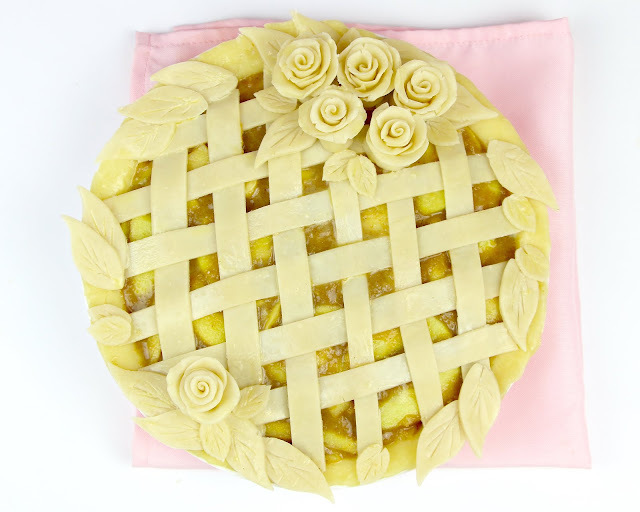 Press your last pie dough into the bottom and up the sides of a 9" pie dish and place on top of a baking sheet, to catch any filling that bubbles over the edge during baking. 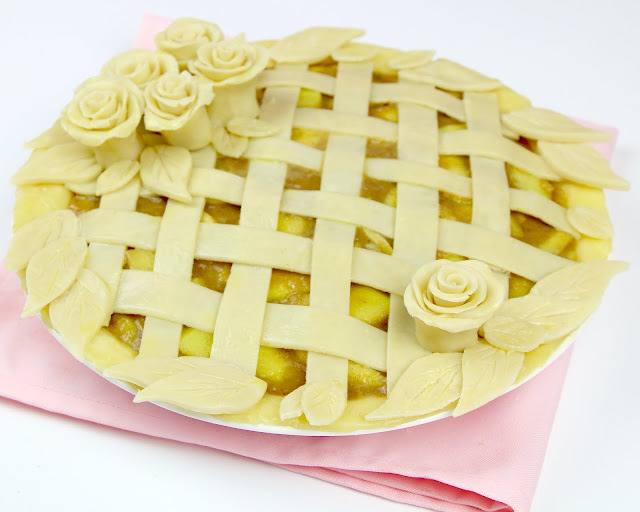 Chill pie dish in the fridge while you prepare the filling. Preheat oven to 425 degrees F. Core, peel and slice your apples into 1/4-inch slices; set aside. Melt butter in a small saucepan over medium heat, whisking constantly, until the butter eventually bubbles, foams and then turns a light brown color, giving off a nutty aroma, about 5-10 minutes. 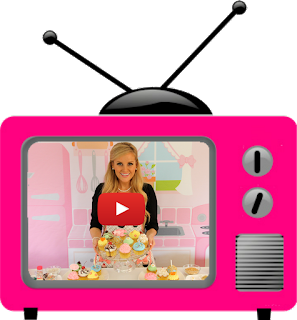 Click here for step by step instructions on how to brown butter. Add flour, and cook for 1 minute, whisking to remove any lumps. 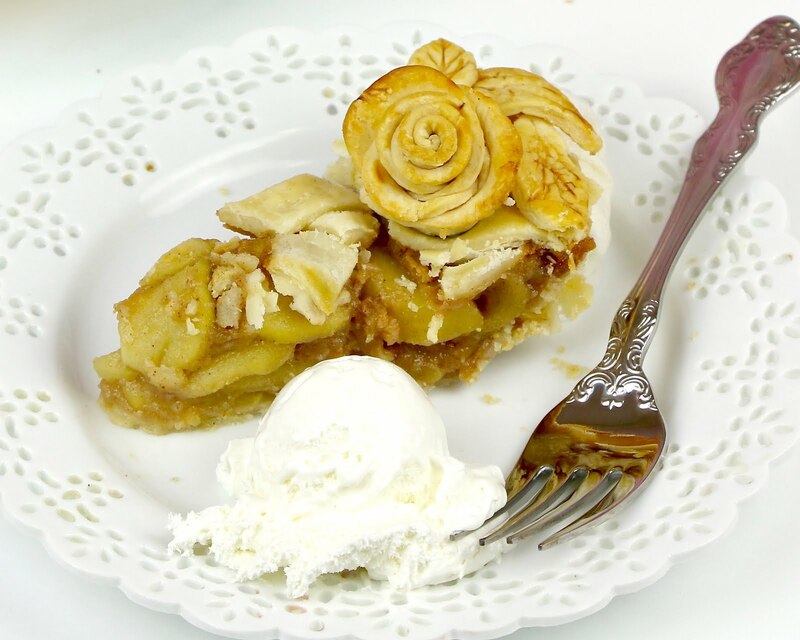 Dissolve cornstarch into apple cider and stir into the butter/flour mixture. Stir in white sugar, brown sugar, cinnamon, nutmeg and salt. Bring to a boil and cook for 1 minute, stirring until thick. 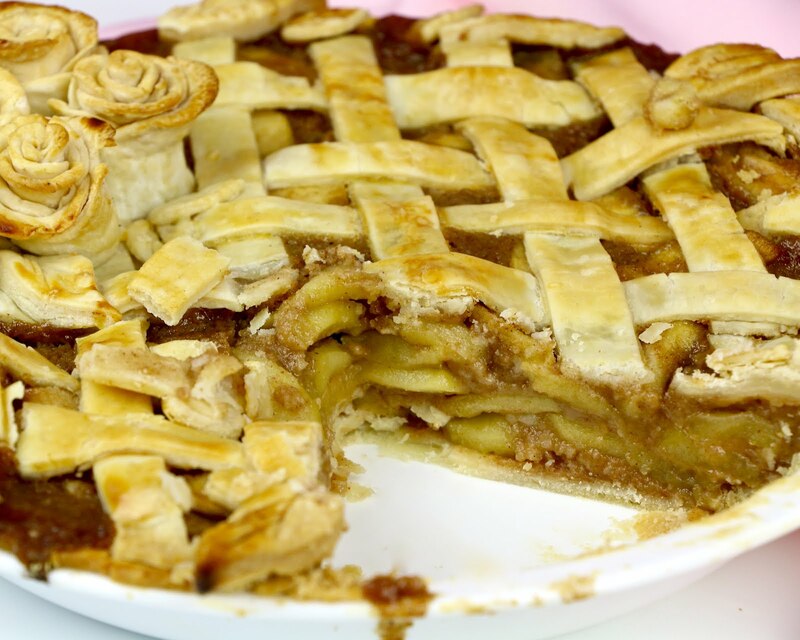 Reduce heat and add vanilla and apple slices. Simmer for about 3-5 minutes, until apples have softened slightly. Let filling cool to room temperature (or store in the fridge for a few days, if making in advance). Once filling has cooled, pour into prepared pie crust. 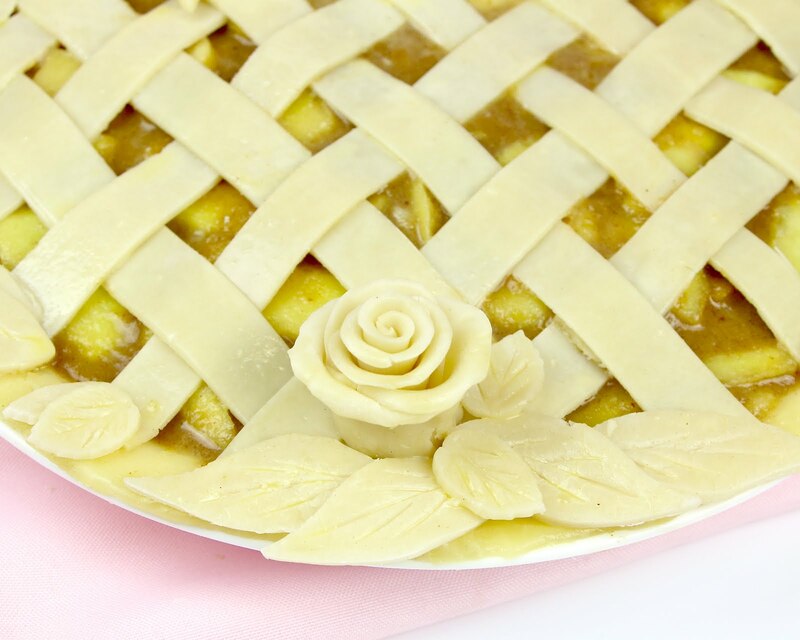 Top filling with lattice pattern. Use a pastry brush to adhere the roses and leaves to top of lattice strips, with egg wash. Brush tops of entire crust and decorations with egg wash.
Bake at 425°F for 15 minutes. 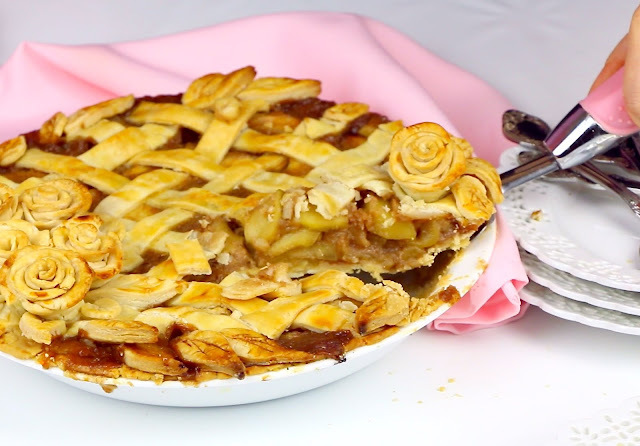 Remove from oven and tent the edges of the pie with aluminum foil if the edges from getting too brown. 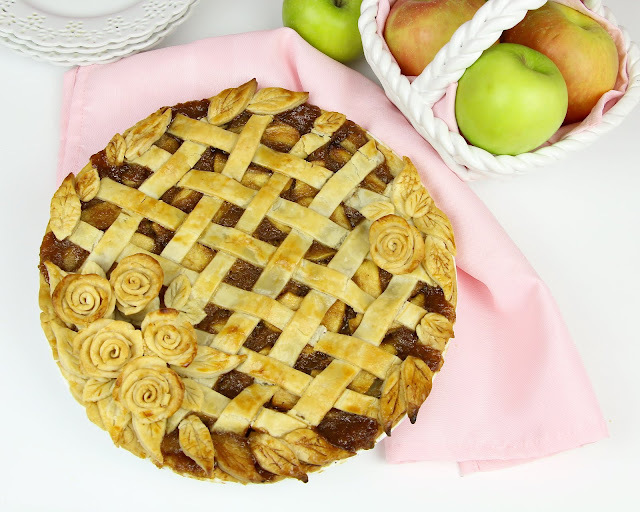 Reduce oven temperature to 350°F and bake an additional 35 to 45 minutes, or until the crust is golden, apples are tender and filling is hot and bubbling.